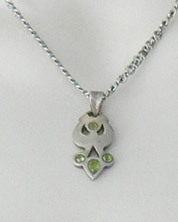 Sterling silver amulet with green crystals. 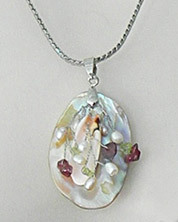 Chain is 15”, high quality but not sterling. 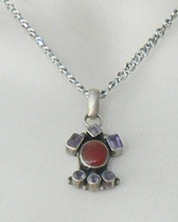 Sterling silver amulet with red stone and gray crystals. Chain is 15”, high quality but not sterling. 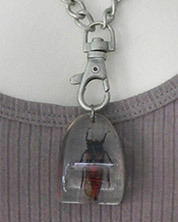 Beetle encased in lucite on heavy watch chain. 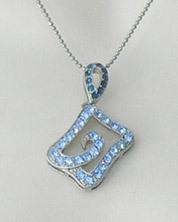 Vintage rectangular pendant with blue rhinestones. 15” chain. 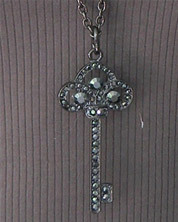 Black key with large, dark crystals and sturdy 29” chain. 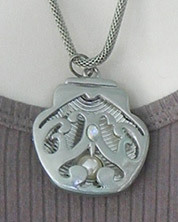 Ornamental, purse-shaped silver pendant with two crystals. 21” barrel type chain. 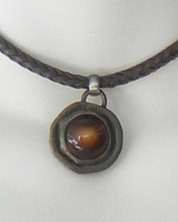 Earthy stone with silver trim on 12” leather cord. Appropriate for guys. 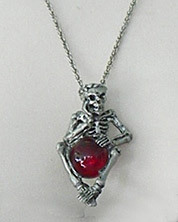 Skeleton with red ball, 20” chain. Halloween time! 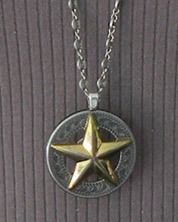 Star belt buckle ornament. Appropriate for guys. 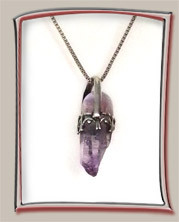 Unique style chain. 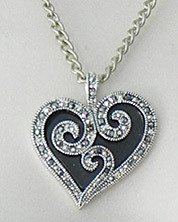 Black heart with marcasite embellishment. 18.5” chain. 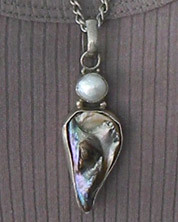 Mother-of-pearl back with multiple pearl dangles. Chain is stamped Pierre Cardin. 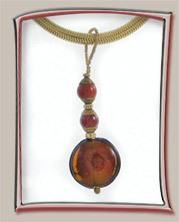 Contemporary amber three-bead dangle. Simple yet elegant. The chain is thick without being too heavy. 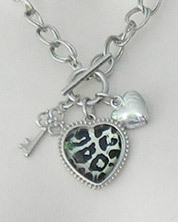 Heart with leopard print. Suitable for a young girl. Lightweight chain. 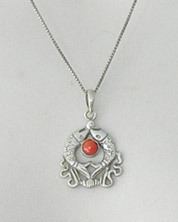 Double fish symbol of happiness in sterling silver with red stone on dainty chain.